John Compagno, M.D., owner/winemaker is of Sicilian extraction. He has been trained in the field of pathology, laboratory medicine and molecular diagnostics, as his full-time job, practicing for over 25 years. However, he appreciates the stability and natural beauty of working in his nearby (he lives and practices in the San Francisco Bay Area) 5-acre Carneros vineyard - pruning, spraying, and tending the vines. He is constantly “on the go” at work and in the vineyard but still finds time to cook old family and traditional Italian recipes whenever possible. Gail Lizak is the co-winemaker. 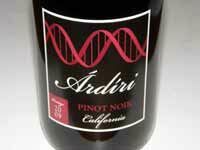 An inaugural 2006 release from this vineyard was one of the finalists at the Pinot Noir Shootout. In late 2008, Ardiri announced they have acquired the Gypsy Dancer property in the Chehalem Mountains AVA of the Willamette Valley. The property consists of 13.5 acres of Pinot Noir, Pinot Blanc and Pinot Gris in the Chehalem Mountains appellation. The wine will be released from this property starting with the 2009 vintage. A tasting room is open at the winery year round Friday and Saturday and other days by appointment.